DGW Auctioneers & Appraisers is your neighborhood auction house with international reach. 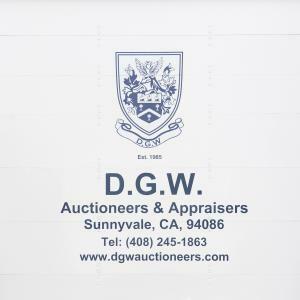 Located in the heart of California’s Silicon Valley and San Francisco Bay Area, DGW conducts a bi-weekly 1000-Lot” Live Public Auction as well as monthly Fine Estates Auctions. Everything from Fine Estates to Everyday General to Interest or Trade Specific items. DGW is the marketplace that showcases SELLERS’ property to a world of BUYERS. Because DGW provides a range of estate clearance services throughout the region our auctions include almost all types of property. Imagine the kinds of things people collect, accumulate and inherit…..That’s what we sell. From Jewelry to Tools; Vehicles to Fine Art; Firearms to Fine Wine; Gold and Sterling Silver, Musical Instruments to Toy Trains………If You’ve Got It, We’ll Sell It. Since 1985 DGW has been providing Auction and Appraisal services to Private Individuals and Families; Estate Executors and Administrators; Banks, Trusts and Fiduciaries, Insurance Companies, Lawyers; Counties, Cities and Police Departments; Business Owners selling in-place commercial assets at on-site auctions; and Maybe You? DGW is the ideal solution for professional and expeditious sales of property for people relocating, down-sizing, settling estates as well as for Collectors and those up-scaling or remodeling. Whatever the need DGW brings Buyer to Seller in a most Fair Market Place. General Estates Auction. Items to include collectibles, comics, pop and fine art, antique and modern furnishings, clocks, tools, fine jewelry, silver, ephemera, sporting and outdoor equipment, rock 'n roll memorabilia, and more. Fine and General Estates sale. Items to include collectibles, comics, pop and fine art, antique and modern furnishings, clocks, tools, fine jewelry, silver, ephemera, sporting and outdoor equipment, rock 'n roll memorabilia, and more. This company has posted a total of 32 estate sales. Only the most recent 31 sales are shown.